I found a conkyrc file I really like and wanted to post it. 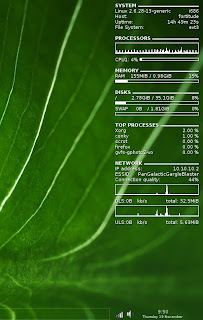 For those unfamiliar with conky, it is a utility that embeds information into your desktop. It was originally a system monitoring utility, but is very flexible and has been used to display things like the weather forecast, unread emails, rss feeds, playlists in Rhythmbox, text files that get modified frequently, and on and on. Conky is the name of the application itself and its config file is .conkyrc and is usually located in your home directory. There are countless sites where people exchange their conkyrc files, so you don't even need to learn the conkyrc syntax to reap the benefits. Just find one you like and slap it into your home directory. I messed around with getting the weather on my desktop (which worked great after following a thread in the Ubuntu Forums), but when I was finished I realized that I only really wanted to do it to see if I could Get it Working and I wasn't really that attached to the idea of having the weather forecast on my desktop. 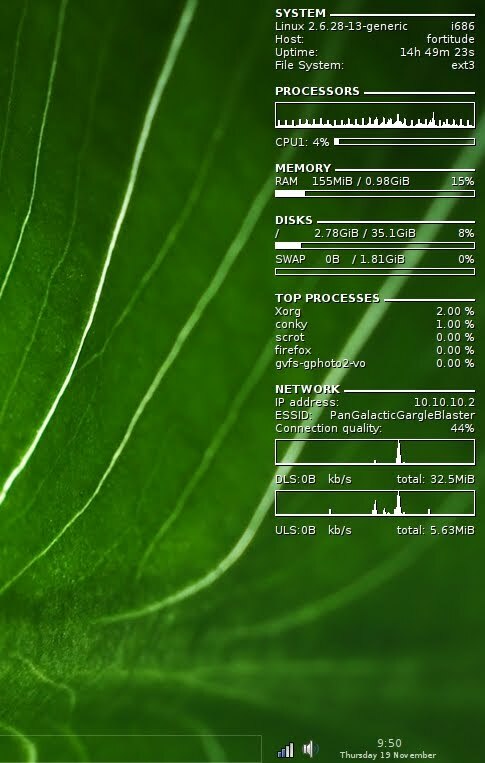 In the end I settled on a more simplistic conky configuration: system information only. I found a really nice conkyrc file on the Crunchbang forums and am very happy with the results. I leared a lot about my system, mostly which processes are taking up resources and what kind of resources are being used most. Anyways, here is the config file and I am providing a screenshot below. Thank you for sharing. Excellent!